I once had an instructor in college who could not get enough of onscreen male bonding - not treacly cop-outs filled with high-fives and lunchpail philosophies and daddy day cares, but commiseration on some of the more uncomfortable/organic facts of life. Aging. Disappointment. Cynicism. Improvised moments of glee that negate all troubles, though only for a moment. I imagine she would be immensely satisfied with "The Trip." 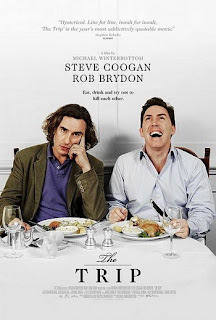 Steve (Steve Coogan) intends to go on a restaurant tour of northern England with his girlfriend, but when she bails he invites his best friend and antagonist Rob (Rob Brydon), an impish Welshman who rarely gets far into a conversation before slipping into one of his celebrity impressions. Both men are simply playing versions of themselves - fictitious, but not by much. The movie is essentially a study in contrasts. Steve is the more famous and pessimistic one, his personal and professional lives are in shambles. Though he is supposedly assigned to seek out the best food in each of the towns on his itinerary, he's more interested in where he can get the best cell reception. He is mortified by fame, save for the fact that it provides him with a steady stream of partners for one night stands. Rob is a massive ham, but a happy one. He's found a wife who will indulge his inscrutable need to transform into Hugh Grant in the middle of a heart-to-heart. And as professional comedians, their unspoken rivalry is just as strong as their obvious bonds of affinity. "The Trip" is all about the emotional shorthand that good friends acquire after years of good times and hard feelings. Outside of some perfunctory concern from Rob about the reason that he's the one accompanying Steve on his trip, there isn't much said between Coogan and Brydon that qualifies as a serious conversation. But these are two people who have learned to sense what the other needs, and what they require most from one another. Sometimes that's a shouting match over whose Michael Caine voice is most accurate. Sometimes it's a therapeutic ABBA sing-along. Perhaps friendship isn't quite as dichotomous as it's portrayed in "The Trip," but it's damn near close.